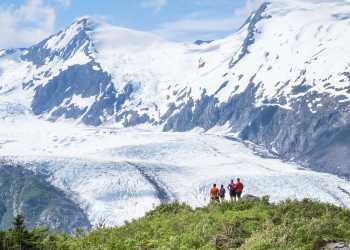 One of the first Chugach access points heading north from Anchorage, Arctic Valley is packed with trails but light on traffic, often giving hikers and other visitors the feeling of having the whole place to themselves. Locals know it best as a community ski hill, but even when the chairlift stops spinning in spring, the area is still a popular spot for outdoor recreation. A one mile path straight up the valley crosses under the chairlifts. The dog and kid friendly path slowly climbs alongside small streams. Wildflowers bloom in June and July. Blueberries, mossberries, crowberries and cranberries blanket the area starting in August; the valley is prime picking territory for berries in late summer. Sharp-eyed and eared visitors might also spot ground squirrels and their burrows along the way. After reaching the saddle, hikers are treated to views overlooking the south fork of Eagle River. From the saddle the trail splits. Rendezvous Peak is the most popular trail. All the way to the top and back is about 4-miles roundtrip with about a 1,500 foot elevation gain. It’s the perfect way to gain views of the Anchorage Bowl and Cook Inlet waters and still be back in time for lunch. To the north, Mount Gordon Lyon grants a better look at the community of Eagle River and Anchorage, as well as Denali views on clear days. It's not quite as tall as Rendezvous, but anticipate a climb and plan for at least 4 miles round trip, depending on route. The surrounding peaks also offer a glimpse of a Cold War relic. A military missile site once topped the nearby mountains on the edge of Fort Richardson. a preservation group offers a few special tours annually. Hikers should obey all posted signs and avoid crossing into the installation inadvertently.